As a service to Veterans and their families, The Law Office of Robert B. Goss, P.C. is pleased to present the following information about specialty license plates for Texas Veterans and their families. DV, Purple Heart, and Meritorious Service Medal recipients are also eligible for parking-fee exemptions in certain instances. Qualifying Veterans pay only $3 for their Disabled Veteran (DV) or Purple Heart license plate, and nothing for a Legion of Valor license plate. 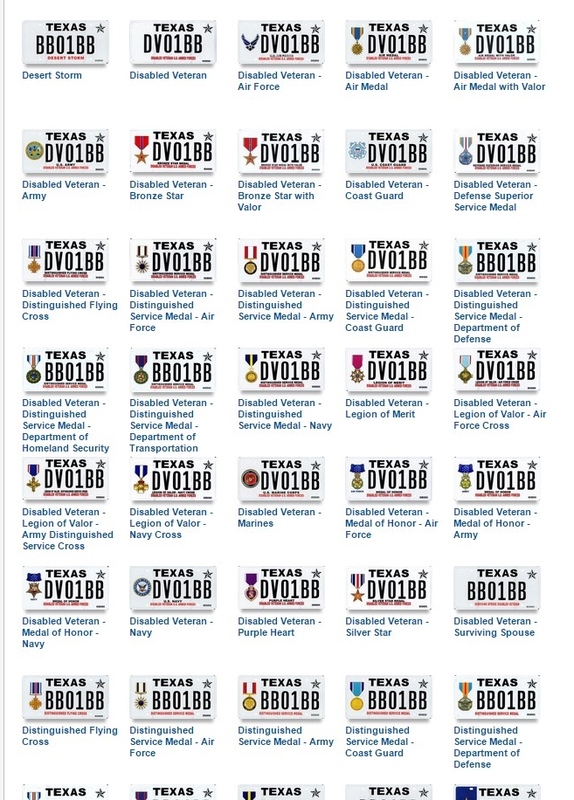 TxDOT has other categories of free or significantly discounted license plates for Texas Veterans as well as for their surviving spouses and family members. Complete Texas Department of Motor Vehicles Form VTR-615. Have a VA representative sign and certify your qualifications directly on the Form VTR-615. (For Purple Heart or Legion of Valor) – Check the appropriate box identifying your medal type. Provide proof, such as your DD-214, that you are the recipient of the medal indicated. You DO NOT need a TxTag to be eligible for TxTag’s toll-waiver program. If your vehicle has the Texas DV, Purple Heart, or Legion of Valor specialty license plate, TxTag automatically knows that information. The TxTag toll waiver is good on many – BUT NOT ALL – TxTag toll roads. If you have one of these plates, you DO NOT need an EZ TAG. However, if you do not have an EZ TAG, you must use the “EZ TAG-Only” lanes. Otherwise, you will have to pay – cash – in the other lanes. If, for some reason, you receive a toll bill when you were driving with your valid, qualifying specialty license plate, you can contact the EZ TAG offices to get the matter resolved. It is difficult to keep up with all the discounts, advantages, and requirements associated with benefits for Veterans. As a Veteran with advanced degrees in both Health Law and Intellectual Property & Information Law, Robert B. Goss has created a legal team dedicated to supporting and representing U.S. Veterans and their families. Don’t wait until it’s too late: Contact the Law Office of Robert B. Goss, P.C. today! The Law Office of Robert B. Goss, P.C. is dedicated to serving Veterans and their families. Don’t miss out on benefits! Contact the Law Office of Robert B. Goss, P.C. today.